Beer Yard glasses or Long Glasses are varied in size, shape an purpose. Let’s start with the tallest beer glass! 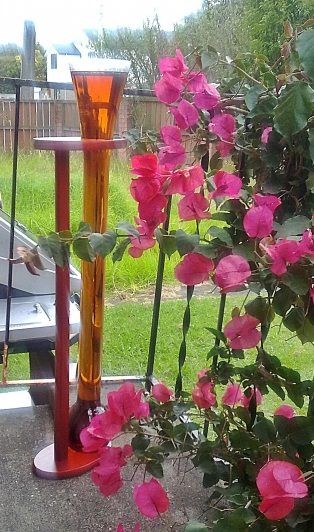 The Long Glass, or Yard Glass – so called because it is about one yard (3 feet) long – is of English origin. Long and slender, the Beer Yard Glass has a trumpet-shaped opening and a bulbous bottom that is supported in a wooden stand. Oh, and it also comes in a half yard size. Depending on the maker of the Beer Yard Glass, it holds about one to two liters of liquid. I prefer beer, but take your pick, please. I suppose that Margaritas could be drunk from them, too, but I’m not sure if our Parrot Head friends would approve. 😉 Besides, we’re talking great beer here! The Beer Yard Glass or Long Glass is rumored to have been used by stagecoach drivers to grab and hold their brew – on the run – so to speak. Actually, it seems unlikely that coach drivers would be drinking from a yard glass. Can you imagine a driver trying to hold – and drink from – a 3’ tall glass of beer, and at the same time, hold the reins and drive the coach, too? “Sorry Madame, for the rough ride. I was tippin’ me yard glass up real high – didn’t see the drop-off”. So, maybe it was, “Stagecoach Drivers Drink Free”. That might get some good business for the innkeeper. And if the driver was loopy…Well… Nevertheless, the Beer Yard Glass is a unique glass to have in your beer glass collection! Browse through our on-line store and get some now! Might as well get a half yard glass too while you’re at it. Cheers! Look for other beer glasses on our site and enjoy collecting them!